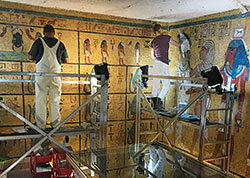 Project team undertaking wall painting conservation in the tomb of Tutankhamen burial chamber. Photo: Lori Wong, GCI. The Getty Conservation Institute’s multiyear project with Egypt’s Ministry of Antiquities for the conservation and management of the tomb of Tutankhamen is nearing completion following the field campaign conducted in February and March. King Tut, as he is called, achieved fame not because of the longevity of his reign (which was less than ten years) or for his prowess in battle; he was perhaps younger than twenty when he died of unknown causes. But he was pharaoh of the world’s mightiest empire at the time of his reign more than three thousand years ago. The treasure discovered in 1922 by Howard Carter in Tutankhamen’s final resting place in the Valley of the Kings draws crowds to the Egyptian Museum in Cairo and to the tomb on the West Bank at Luxor where Tutankhamen’s sarcophagus, outermost gilded coffin, mummy, and clay seals from the entryway to the tomb remain. Key aspects of the collaborative project included conservation of the wall paintings in the burial chamber, the only decorated room in the small tomb; refurbishment of the infrastructure, which includes a new viewing platform, stairs and ramp, lighting, and a filtered air supply to reduce dust, humidity, and carbon dioxide from heavy visitation; and Arabic translation of the existing interpretive panels. Scientific investigation of the materials and techniques of execution of the wall paintings, detailed documentation of the condition, and study of the causes of deterioration all preceded the wall painting conservation, which emphasized stabilization and cleaning. Working with experts from the Ministry of Antiquities and the private sector in Egypt, the project utilized expertise from many disciplines, including architectural design, environmental science, and documentary filmmaking. It also included the training of local conservators and inspectors for the future management and maintenance of the tomb.